This watch was beautiful, however I couldnt wear the cuff part of it. The watch was made very well, it's just my wrist are bigger than the average woman so the cuff part was tight on me. The Floral pattern is beautiful, I wish I could have worn it. 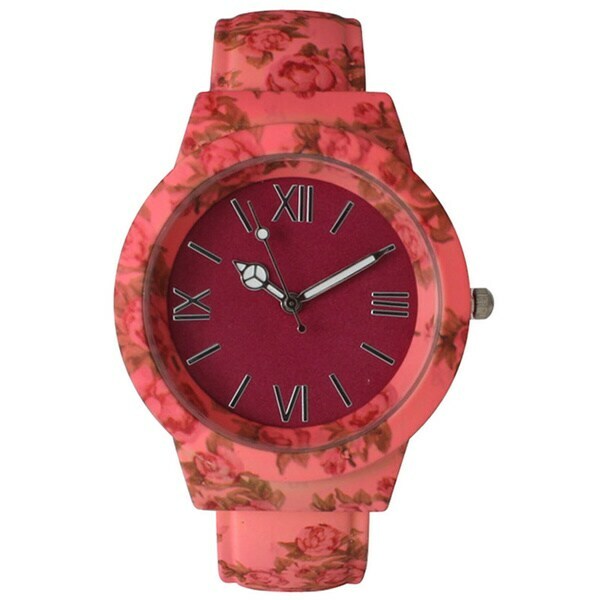 Featuring beautiful vintage floral accents as well as a peace sign watch hand accent, this Vintage Flowers and Peace Cuff Watch by Olivia Pratt is a lovely complement to any outfit. This watch has a stylish cuff bracelet with a stainless steel construction and reliable Chinese quartz movement. While being a larger watch this piece is just outstanding. The white with little pink and green flowers appears so delicate and pretty. I love cuff watches and this one is a real winner! This watch is really cute. I ordered it in white and it has colorful turquoise and purple flowers. The band is rubber and it looks good with jeans, casual dresses, and shorts. The battery wore out quickly but it was worth buying another battery. I would buy this watch again in another color. I bought 2 of these watches, one for me, one for a friend. I gave mine away as I didn't really love it and wasn't thrilled with the cuff closure. My friend loved hers. At first I thought one wasn't working, but it had a tab that kept the stem pulled out so as not to wear out the battery. I liked the color options, and the flowers pattern was cute. Best for some one with a smaller wrist. Love this watch. I have received compliments on it each time I wear it. The cuff is very comfortable-does not pinch your skin like some of them do. THIS IS A GIFT TO MYSELF. I LIKE CUFF WATCHES. "Is this watch open on the wrist or does it have a clasp of some sort - none of the pictures show how the band attaches"
This is a cuff watch. I am not showing this watch to be waterproof.